AI-AP | Profiles » Illustrator Profile: Samantha Hahn: "Painting fashion is an opportunity to celebrate color, movement and grace"
Illustrator Profile: Samantha Hahn: "Painting fashion is an opportunity to celebrate color, movement and grace"
Samantha Hahn is a Brooklyn-based artist who has created distinctively stylish fashion and beauty illustrations for numerous outlets, including Glamour and The Cut, as well as illustrating New York Fashion Week for the Council of Fashion Designers of America. She also has a distinctive hand lettering style that has appeared in “everything from captions in the Paris Review to Marie Claire magazine cover lines.” Hahn makes her illustrations with ink and watercolors that she refines in Photoshop, and she has expanded her work to include live painting for a range of clients, including Refinery29 at SXSW. Hahn’s latest illustrated book, A Mother Is a Story: A Celebration of Motherhood was released in late March. I’m a Brooklyn-based illustrator and author. I work with a variety of clients in fashion, beauty, editorial, publishing, advertising, licensing and branding. 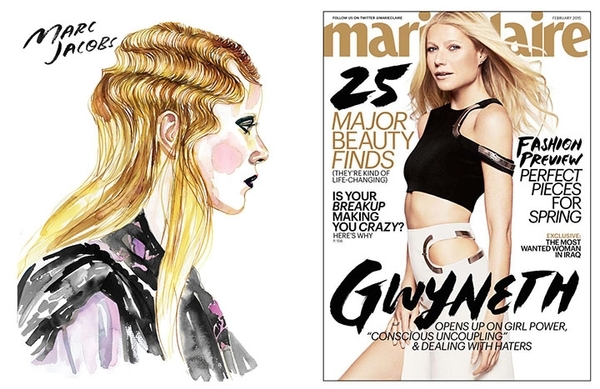 My style is decidedly feminine with delicate quill lines and lush watercolor. I have also hand lettered everything from captions inThe Paris ReviewtoMarie Clairemagazine cover lines. I officially went solely freelance five years ago. I grew up in a creative family. My mom was an illustrator and my dad was in the music business. It was completely natural for me to see that my creative passion could be a commercial pursuit. I also saw how quickly and easily I could lose it all if I didn’t maintain my hustle. I got a BFA in illustration from Syracuse University. After graduation I worked at a magazine. I hated having a desk job (I felt like a caged animal) so I thought maybe I could teach art to kids and paint at night. I got an MA in art education from Columbia University and taught while moonlighting as an illustrator and finding my niche in the market. During maternity leave I ramped up freelance work, went back to teaching part time until I had enough work to leave and pursue illustration all the way, which felt like home. I sometimes dream of working in a studio, having lots of space to do larger scale projects and experiments, but at the end of the day I have two young children and working in my home studio allows me to go back to work at night if need be and still be on hand if anyone calls out that they need to pee. Once the desired style is chosen I submit a finished illustration, never a pencil sketch. It has been very effective for art directors to peruse my site and submit a few pieces they respond to for style and level of detail. Then we discuss ideas and I dive right in. I primarily get hired to use concentrated inks with quill and brush. I do everything by hand and then scan. In Photoshop I clean up the images and sometimes heighten the contrast. I arrange elements within the composition digitally so that if tweaks are needed I don’t have to start from scratch but instead can shift the background wash, remove an element or change scale with ease. This yields the best results that are super fast. I have a few in different areas that I feel made me the illustrator I am today. My first big break was from Glamour magazine. I illustrated a monthly column called The Glamour List. I learned a lot about my working process through that job. Later in my career The Cut hired me to go backstage at New York Fashion Week. It was a crazy fast-paced job but really special as it helped me develop the style I mainly get hired for today. Another big break was doing a series for the Paris Review that illustrated Rachel Cusk’s novel when it was published in serial. As much as I adore painting gestures, textures, and grace in fashion/beauty projects I crave the opportunity to work outside of that box. So when I had the chance to work in grayscale and portray characters and scenarios from a novel it was challenging and exciting. I’d say growing up in Manhattan was an influencer. I always enjoyed people watching and New Yorkers are so unique and expressive. I was lucky to grow up with creative parents simply to see that it’s natural to do art professionally—I can't fathom an alternative. I can’t say that I had one major artist influence but I always loved going to museums and seeing photographs and paintings. I admire so many fellow artists but I have to say that I’m always blown away by female entrepreneurs like Christiane Lemieux, Christene Barberich, Ariane Goldman and Rachel Schectman who have all taken their amazing ideas and built amazing platforms for expression and inspiration. One of the many things these women have in common is the desire to give other women opportunities to shine and to me that’s one of the greatest things women can do for each other. I like looking at my friends who are working creatively and people on the internet doing cool sh*t. I think looking outside of illustration is important so I look at my friends' work: Prop stylist Randi Brookman Harris, designers Erin Jang, Abby Clawson Low, Liz Libre and Linsey Laidlaw. The site It’s Nice That is full of inspired photography and other amazing things. Having to be my own biggest motivator. There are unpleasant tasks to do in any business and I have to remind myself that I’m not an artist in a garret somewhere with a beret on—this is a business that needs to be run. If I have downtime I need to market, generate personal projects, update my job log, clean up my studio…be my own boss! I loved collaborating with Story—an amazing space that takes the point of view of a magazine, changes like a gallery and sells things like a store. It was a really unique opportunity to help create an experiential space. I created signage, portraits and even a hand-lettered font. I also loved collaborating this year with the CFDA (The Council of Fashion Designers of America). Each day of New York Fashion week I painted my perspective of looks from specific shows, up to three per day. The CFDA added the looks to a portfolio on their site multiple times per day, which at the end featured over 30 illustrations. Painting fashion is an opportunity to celebrate color, movement and grace and convey the overall mood of a show while trimming out extraneous details that a camera can’t help but capture. This year I started doing live painting events too. Refinery29 asked me to paint guests at an event at SXSW. I had never done it but could not resist the opportunity. It’s a great way to work from direct observation and chat with people and when the event is over the job is done. It’s funny because sometimes people will be like “should I put lipstick on for this?” and I explain that it’s more impressionistic. Clients like the loose colorful interpretations and I find them really freeing as I’m so used to doing tightly rendered work based on photo reference. I loved doing the event even though I was scared I’d mess up in front of someone who was watching as I worked. Somehow as the night went on I got faster, looser, and just more playful. Chloe is the brand I work with the most in this category now and I’m a bit more pared down color-wise but still, I keep it pretty loose and expressive and people seem really thrilled to sit for the portraits and take them home at the end of the night. I can do each one in two to four minutes. My dream jobs are ones where there’s mutual love and respect between myself and the art director. I love going into a project where I feel that feedback from the art director is a gift that’s going to make me better and stronger as an artist. It’s always an honor to be reached out to by someone whose work you admire. I loved working with Charlotte Strick on the Paris Review. Charlotte saw my ability to convey ennui and hired me even though I had no grayscale work in my portfolio. We worked closely together and with editor in chief Lorin Stein on each installment of Rachel Cusk’s novel, Outline. With Charlotte’s feedback I feel that I came out the other side of that project a stronger illustrator. I really like Lauren Tamaki’s work. She straddles the perfect balance of conceptual and beautiful. I love the work of Christopher David Ryan; he imbues his characters with love. Matt Dorfman can express so much, so clearly, Julia Rothman’s work is full of whimsy and spirit. There are too many to name! I love Lisa Congdon, Adrian Tomine, Helen Dealtry, Marcos Chin…the list goes on. My new book is A Mother is a Story: A Celebration of Motherhood, an inspiring collection of unique quotes in my signature watercolor style. The quotes range from witty and irreverent to touching and thoughtful; each page presents sentiments and snippets of wisdom that speak to the spirit of motherhood. Motherhood powerfully transformed my life, and transformed me. Crafting this book, I sought to portray the experience in all its glorious, messy, sometimes terrifying beauty. Nothing in life prepared me for the instant mad love I felt at the first sight of each of my children, or the emotion I feel each time I smell them, or feel the softness of their skin and the warmth of their bodies. To be a mother is sublime. I really wanted this to be visually special so instead of having quotes on one page and illustration on another, I looked at each spread as an image and found ways to incorporate art and lettering into each other. I selected quotations I hope mothers of all ages and stages can recognize themselves in, words that can profoundly stir treasured memories of our children at each stage of life. I created my illustrations to convey my sense of the emotions of those words, the fragile, titanic beauty of the deepest love—the love of a mother for her children. I secretly have the worst handwriting. In fact I sometimes get carded at the bank for not having a consistent signature so when I decided to add hand lettering to my portfolio I had to think of it as art and not writing. I sometimes reference a font in watercolor but mainly am hired to do a loose brushy style. Marie Claire hired me to do cover lines twice and I’ve lettered for Vogue Nippon, Spur Magazine, Conde Nast Traveler and many others. What’s interesting about lettering is how absolutely easy and effortless it looks. The same holds true for watercolor paintings but with both I have to do the work over and over until one version is right. There’s no fixing an error or working over it since it’s so transparent and the negative space is so essential. So for lettering projects I sometimes paint a word out 50 times until it’s good. I did a lot of hand lettering in both of my books and played around with different styles. I’m losing my notion that social media is super effective. I like Instagram to share work and projects with editors and friends but I think the most effective means of promotion is to do commercial projects and see them published. I have an industry newsletter mainly for the clients who have hired me. A personal email submission to one particular client (NOT an e-blast) has proven effective as well. I love getting into American Illustration. The work chosen is really fresh and good and nothing is more validating in my career and personally than being in company I admire. Getting into the industry is like jumping onto a moving freight train. I jumped and got into one car and they may parachute in. One artist’s point of entry is different than another. Some may take years; others may get in right away. It depends on what’s happening and how quickly you see it. What you can do is make your portfolio cohesive. It’s OK to have various categories and styles as long as they look like they’re done with the same hand. Do as much real work as you can even if you have to make a show poster for your friend’s band or a look book for your friend’s indie jewelry line. Submit everywhere that you see work that you feel you could have done. At first your potential may be higher than your ability but all you need is one art director to give you an opportunity to shine. When they do, work hard, kill it and then share it with other potential clients. Rinse and repeat. Illustrator Profile - Lisk Feng: "Believe in your work. Love what you do."